This morning at 6 AM, Big Ben, the clock tower over Parliament, chimed the news that London joins other European capitals in the bike-sharing revolution with the introduction of Barclays Cycle Hire. London Mayor Boris Johnson is following the same path as Paris Mayor Bertrand Delanoë did 3 years ago this month by bringing bike-sharing to his city’s citizens. 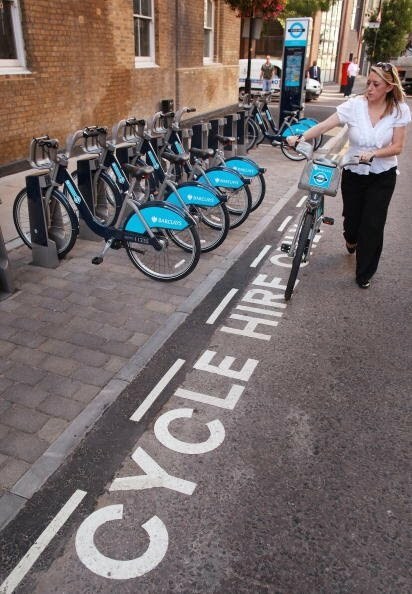 Although London’s Barclays Cycle Hire is one quarter the size of Paris’ Vélib’, it will be just as transformative. Following the same formula as most bike-sharing systems, one can subscribe for one day at £1 ($1.55 US), one week at £5 ($7.80 US) or one year at £45 ($70 US). The first 30 minutes are free and then the next 30 minutes of use is £1, and after that the price for keeping the bike escalates very steeply. The cost of the Cycle Hire member “key”, the RFID access card, is £3 ($4.70 US). For the first month, the system will be open only to members who register online for any level of subscription. To date, about 10,500 people have registered to become "pioneer" members of the scheme. The bikes will not be available for walk-up “casual use” to non-members during this breaking-in period. 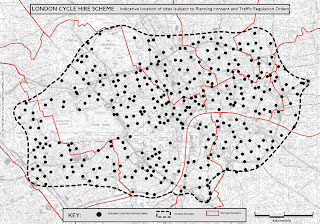 SERCO, the operator, and Transport for London (TfL) want the bikes to be the very best system possible and to understand how members engage with the scheme. So don’t rush to London and expect to whip out your Barclaycard, Visa, or Master Card at a station and try to grab a bike just yet. When fitted out, Barclays Cycle Hire will have 6,000 bikes and 400 stations all over central London. 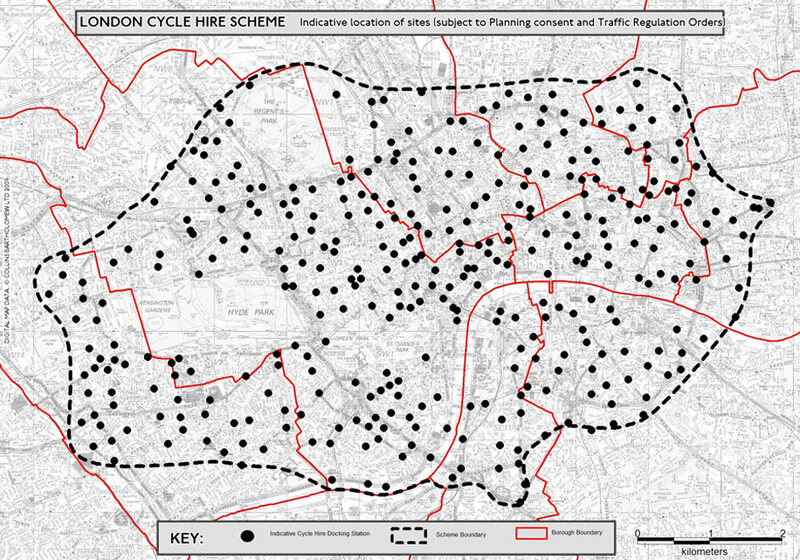 Only around 4,800 bikes and 330 stations will available at first (see the map below). The bikes will not have auxiliary locks, so they will need to be re-docked for safe keeping. With the docking stations fairly close to each other, this should not present difficulties. We all know bike-sharing is for short trips anyway! To help keep trips short, London has just opened up new bike lanes called Barclays Cycle Superhighways to get into and through central London a bit easier and faster. 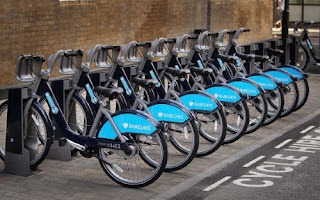 To reduce auto traffic, London’s City Hall sees these new bicycle amenities as a start of many initiatives it can really bank on as is evident by the £25 million (over $39 million US) sponsorship for the bike-sharing and the new bike lanes from Barclays Bank. 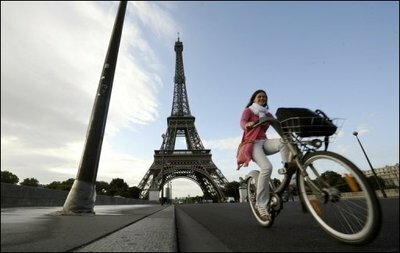 The Cycle Hire bike is similar to the Vélib’ of Paris in size and weight. The bikes are made in Quebec, Canada by Divinci and supplied to London by Public Bike System Company. These same bikes are in service in Montréal, Bixi – BicycleTaxi, Minneapolis, Minnesota - NiceRide, and in Washington, DC and Arlington, VA - Capital Bikeshare in September. The bikes should be sturdy enough for London traffic. From now on, the streets of London will flow with a new transportation icon: the bike in blue, black, and gray; its place secure with the double decker red bus and the ubiquitous black taxi. This summer brings a new regional bike-sharing system, Metroradruhr, to ten industrial Ruhr valley cities. Starting on June 18th in Dortmund, Germany the system has now reached five of the cities. Bikes are now or soon will be available in Bochum, Bottrop, Dortmund, Duisburg (site of this week's horrific music festival stampede), Essen, Gelsenkirchen, Hamm, Herne, Mülheim an der Ruhr and Oberhausen. This is not just a series of suburban satellite additions to a larger city system, but a single system connecting nearby cities together. The most similar operation is Italy's Bicincittà, but the cities and stations of Metroradruhr are close enough together to allow bikes to move between cities. Metroraruhr operates using the neXt bike telephone rental system. 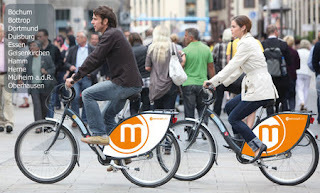 As with neXt bike, Metroraruhr has the convenience of reserving bikes for large groups in advance. Registration is required to use the system, but there are no subscriptions. The price is €1 per hour ($1.30 US) for any bike or according to which bike is chosen, starting from €5 per 24 hours ($6.50 US). Linking an area together with a single bike-sharing system has incredible convenience for the users and strengthens a region's public transit options. As we all know, Bike-sharing in Germany is really Rad-verleihsystem! 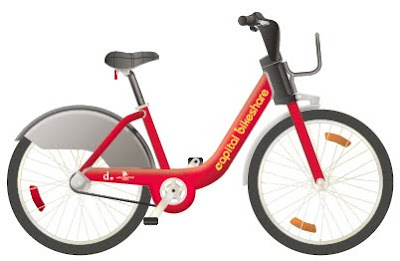 The first photos of Capital Bikeshare are in! The prototype bikes look great. Branded to match the D.C. Circulator bus, Capital Bikeshare bikes are red with the Capital Bikeshare logo in yellow on the downtube. Similar to other bikes in the Bixi Community, your bikes have flashing front and rear LED lights, reflective sidewall tires, adjustable seat post with marked numbers (to help you remember your seat height), and a carrier with bungee cord on the front. The launch of Capital Bikeshare is right around the corner in September. The actual launch date is still to be determined. 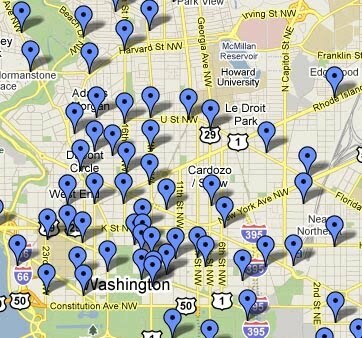 Capital Bikeshare will change Arlington and D.C. forever. With Arlington's stations announced in July 7's post "Capital Bikeshare Readying to Ride", Washington's D.C.'s stations were announced today, thereby fleshing out the initial 114 stations of the Capital Bikeshare network. On the District of Columbia's Department of Transportation website, a map of D.C.'s 100 stations is provided covering all eight wards of the city. Downtown is densely covered with stations every couple of blocks with inner neighborhoods also well covered. More distant neighborhoods will have to wait until the service gets more funding, so that D.C.'s network isn't stretched too thin at the launch. I'm also happy to report that there is a station two blocks from my home. This truly brings a tear to my eye. I lobbied for a station closer to my home, however, didn't want folks entering my living room at all hours of the day and night. In other news, our temporary CapitalBikeshare.com website is now live. Visit us and leave your email address so we can tell you when registration opens - likely in early August. Stay tuned... Lots more good stuff happening with Capital Bikeshare! UPDATE (7/20, 3pm): DDOT will be making live a revised station map later today. Posted by Paul DeMaio at 10:03 PM No comments: Labels: Arlington, Capital Bikeshare, D.C.
Three years ago today, the bike-sharing world woke up to a revolution in Paris, France. Although, not the first service in the world, Vélib' was definitely the biggest. It made such a media splash, the entire world started thinking "bike-sharing." In three years, 80 million trips have been made on these ubiquitous gray bicycles. The system has grown from around 10,000 bikes at 750 stations to 25,000 bikes at 1,800 stations which service all of Paris and its first ring of suburbs. There are 162,000 yearly subscribers to the system, down from a high of 200,000, but subscriber's usage is up over 11% according to Ville Rail & Transport. There have been growing pains for the system with some maintenance and shrinkage problems. It is no longer the biggest system in the world, that honor goes to the one in Hangzhou, China which has 50,000 bikes. Yet the system is healthy and brings in money to the operator, JCDecaux, and the City of Paris. The latest statistic show that it is used by everyone from all walks of life: 48% are women and 52% are men, 16% are under the age of 25 and 8% are over the age of 56, and 10% of all users are students. There are rumors of a 30% price increase for the daily and weekly subscriptions this fall, but the price of the yearly subscription is to remain a reasonable €29 ($36.85 US). We're updating the design of The Bike-sharing Blog to make it look better and be easier to use. Let us know what you think! Yesterday the United States Federal Transit Administration awarded a $3 million grant to the Massachusetts Bay Transit Authority (MBTA) to fund the Boston Bike-share Project: "An innovative and truly transformational project, the Regional Bike Share System is a multiple-city bike sharing system making thousands of bicycles available throughout the Boston metropolitan area with the swipe of a card." 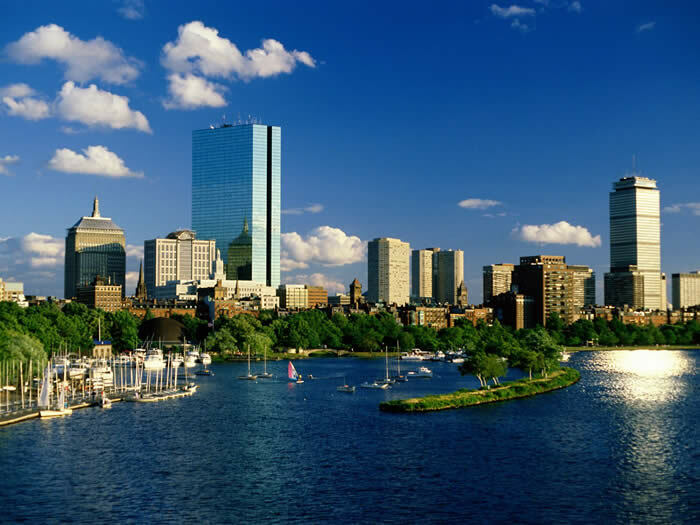 According to the Boston Globe, Nicole Freedman, the head of the city's Boston Bikes program, said, "This takes us over one of the main hurdles with bike share, which is having enough funding to have a launch size that we’re confident will succeed. Too few bikes and rental stations could doom the program to irrelevancy." 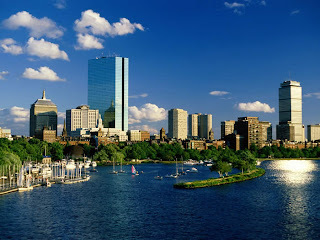 This money will allow Boston to proceed, after this year's postponement due to insufficient funding, to create the large bike-sharing program that we reported in The Bike-sharing Blog on August 12, 2009. Much credit goes to Boston Bikes and the MBTA for creative thinking about Bike-sharing funding for systems in the United States. This grant to Boston reinforces what The Bike-sharing Blog has championed: Public Use Bicycles are an integral part of a city's public transit system. It extends, compliments and enhances all transportation options. That sound of a Boston Bike-share bell 'bing' should be a wake up call to the many city governments in United States, which are thinking about Bike-sharing. The Federal Government thinks it's a good idea. With the launch of Washington, D.C. and Arlington, Virginia’s bike-sharing service just two months away in September, the buzz is spreading over the region as to the name and look of the bike. Through a public voting process, the name “Capital Bikeshare” won the most votes. The bikes soon will be found at over 114 locations in the region with a fleet of 1,110 bikes, making it the new largest service in the U.S. and one of the few regional services in the world. The Arlington portion of the service will be comprised of 110 bikes and 14 stations. This map shows the likely locations of Arlington’s first phase of stations. The bike design is coming together as well. While other bike-sharing services throughout the world have bikes colored gray to fit in with the historic architecture of some cities, and others are neon colors to make them eye-catching, Capital Bikeshare bikes will be dark red to match D.C.’s Circulator bus (and upcoming streetcar) branding. The color is unobtrusive, yet energized. 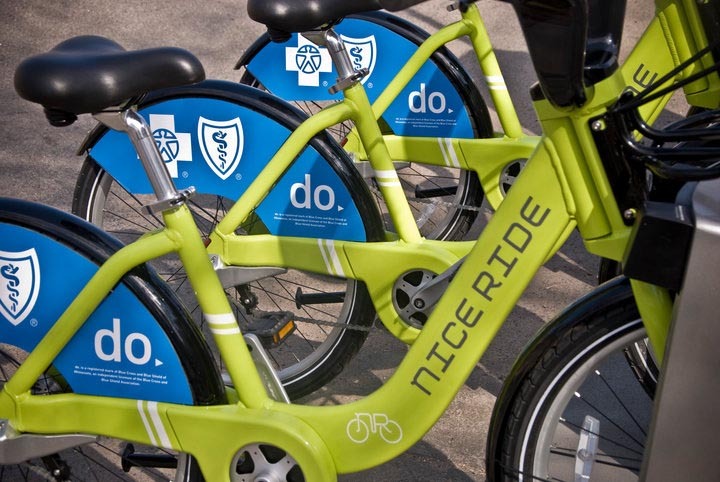 With organizations like Barclays, Rio Tinto Alcan, and Blue Cross/Blue Shield sponsoring bike-sharing services elsewhere, the Arlington service is now open for sponsorship too. Sponsorship opportunities are competitively priced and provide organizations a way to support a clean, green, and healthy transport mode for the 21st century. Contact MetroBike for more information about Arlington’s service or station sponsorship opportunities. And of course, Londoners and visitors need to know how to ride safely. So Barclays Cycle Hire also produced an illustrated safety video too. By far, these are the best bike-sharing instruction and safety videos I've yet to see. I'm sure these videos cost a pretty penny to create. It's nice to be sponsored by a bank.